Spencer stole her sister's boyfriend. Aria is brokenhearted over her English teacher. Emily likes her new friend Maya . . . as much more than a friend. Hanna's obsession with looking flawless is making her sick. And their most horrible secret yet is so scandalous that the truth would ruin them forever. And why shouldn't I tell? They deserve to lose it all. With every crumpled note, wicked IM, and vindictive text message I send, I'll be taking these pretty little liars down. Trust me, I've got enough dirt to bury them alive. How it really began . . .
You know that boy who lives a few doors down from you who's just the creepiest person alive? When you're on your front porch, about to kiss your boyfriend good night, you might glimpse him across the street, just standing there. He'll randomly appear when you're gossiping with your best friends—except maybe it's not so random at all. He's the black cat who seems to know your path. If he rides by your house, you think: I'm going to fail my bio exam. If he looks at you funny, watch your back. Every town has a black-cat boy. In Rosewood, his name was Toby Cavanaugh. "I think she needs more blush." Spencer Hastings leaned back and examined one of her best friends, Emily Fields. "I can still see her freckles." "I've got some Clinique concealer." Alison DiLaurentis sprang up and ran to her blue corduroy makeup bag. Emily looked at herself in the mirror propped up on Alison's living room coffee table. She tilted her face one way, then another, and puckered her pink lips. "My mom would kill me if she saw me with all this stuff on." "Yeah, but we'll kill you if you take it off," warned Aria Montgomery, who was, for her own Aria reasons, prancing around the room in a pink mohair bra she'd recently knitted. "Yeah, Em, you look awesome," Hanna Marin agreed. Hanna sat cross-legged on the floor and kept swiveling around to check that her crack wasn't sticking out of her low-rise, slightly-too-small Blue Cult jeans. It was a Friday night in April, and Ali, Aria, Emily, Spencer, and Hanna were having one of their typical sixth-grade sleepovers: putting way too much makeup on each other, chowing on sea salt and vinegar Kettle chips, and half-watching MTV Cribs on Ali's flat-screen TV. Tonight there was the addition of everyone's clothes spread out on the carpet since they'd decided to swap clothes for the rest of their sixth-grade school year. Spencer held up a lemon-yellow cashmere cardigan to her slender torso. "Take it," Ali told her. "It'll look cute on you." Hanna pulled an olive corduroy skirt of Ali's around her hips, turned to Ali, and struck a pose. "What do you think? Would Sean like it?" Ali groaned and smacked Hanna with a pillow. Ever since they'd become friends in September, all Hanna could talk about was how much she looooved Sean Ackard, a boy in their class at Rosewood Day School, where they'd all been going since kindergarten. In fifth grade, Sean had been just another short, freckled guy in their class, but over the summer, he'd grown a couple inches and lost his baby fat. Now, pretty much every girl wanted to kiss him. It was amazing how much could change in a year. The girls—everyone but Ali—knew that all too well. Last year, they were just . . . there. Spencer was the überanal girl who sat at the front of the class and raised her hand at every question. Aria was the slightly freaky girl who made up dance routines instead of playing soccer like everyone else. Emily was the shy, state-ranked swimmer who had a lot going on under the surface—if you just got to know her. And Hanna might've been klutzy and bumbling, but she studied Vogue and Teen Vogue and every once in a while she'd blurt out something totally random about fashion that no one else knew. There was something special about all of them, sure, but they lived in Rosewood, Pennsylvania, a suburb twenty miles outside Philadelphia, and everything was special in Rosewood. Flowers smelled sweeter, water tasted better, houses were just plain bigger. People joked that the squirrels spent their nights cleaning up litter and weeding errant dandelions from the cobblestone sidewalks so Rosewood would look perfect for its demanding residents. In a place where everything looked so flawless, it was hard to stand out. But somehow Ali did. With her long blond hair, heart-shaped face and huge blue eyes, she was the most stunning girl around. After Ali united them in friendship— sometimes it felt like she'd discovered them—the girls were definitely more than just there. Suddenly, they had an all-access pass to do things they'd never dared before. Like changing into short skirts in the Rosewood Day girls' bathroom after they got off the bus in the morning. Or passing boys ChapStick-kissed notes in class. Or walking down the Rosewood Day hallway in an intimidating line, ignoring all the losers. Ali grabbed a tube of shimmery purple lipstick and smeared it all over her lips. "Who am I?" The others groaned—Ali was imitating Imogen Smith, a girl in their class who was a little bit too in love with her Nars lipstick. "No, wait." Spencer pursed her bow-shaped lips and handed Ali a pillow. "Put this up your shirt." "Nice." Ali stuffed it under her pink polo, and everyone giggled some more. The rumor was that Imogen went all the way with Jeffery Klein, a tenth grader, and she was having his baby. "You guys are awful." Emily blushed. She was the most demure of the group, maybe because of her superstrict upbringing—her parents thought anything fun was evil. "What, Em?" Ali linked her arm around Emily's elbow. "Imogen's looking awfully fat—she should hope she's pregnant." The girls laughed again, but a little uneasily. Ali had a talent for finding a girl's weakness, and even if Ali was right about Imogen, the girls all sometimes wondered if Ali was ever ripping on them when they weren't around. Sometimes it was hard to know for sure. They settled back into sorting through one another's clothes. Aria fell in love with an ultrapreppie Fred Perry dress of Spencer's. Emily slid a denim miniskirt up her skinny legs and asked everyone if it was too short. Ali declared a pair of Hanna's Joe's jeans too bell-bottomy and slid them off, revealing her velour candy-pink boy shorts. As she walked past the window to the stereo, she froze. "Oh my God!" she screamed, running behind the blackberry-colored velvet couch. The girls wheeled around. At the window was Toby Cavanaugh. He was just . . . standing there. Staring at them. 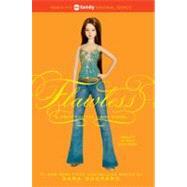 Pretty Little Liars #2: Flawless. Copyright Â© by Sara Shepard . Reprinted by permission of HarperCollins Publishers, Inc. All rights reserved. Available now wherever books are sold.